The call came on Martin Luther King, Jr. Day seven years ago. Michelle Buscher, then 42 years old, was soundly slumbering, enjoying the last day of a three-day weekend before going back to work. Her phone rang promptly at 8 a.m. The woman at the other end of the line told her that her test results came back. Michelle had lobular invasive carcinoma. “What did you say?” she asked the woman, waking up her husband, Jerry. “Honey, you have cancer. You need to come in tomorrow and talk to the surgeon,” the woman explained. Michelle is one of three women who were randomly chosen as Super Survivors to be honored at this year’s Memorial’s Be Aware Women’s Fair. The seventh annual event will be held from 9 a.m. to 2 p.m. Saturday, Oct. 8, in the Orr Building at the Illinois State Fairgrounds. Michelle’s journey began late summer of 2008 when she found a lump on the upper part of her left breast. She didn’t think much about it because she had found lumps before over the years. They come and go and are typically nothing. This one didn’t go away and began to feel tender when touched. She scheduled a mammogram for early December, but rescheduled it for the following month to attend a funeral. “They called me back the next day and said they wanted me to come in for another one, because they think they might have seen something on it,” Michelle said. Her cancer was diagnosed as Stage 2B. The tumor was an odd shape, like a barbell, which concerned her doctors that it might be breaking off into another tumor. 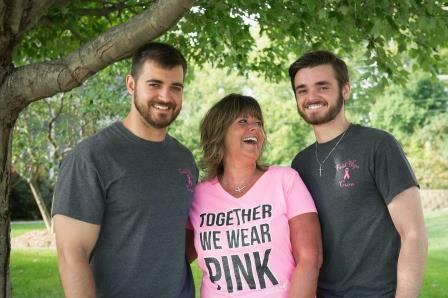 Michelle had a mastectomy scheduled about two weeks after the cancer was confirmed, which was followed by reconstruction surgery. In March, she began chemotherapy, eight treatments over four months. And that was followed by 30 days of radiation therapy. The chemotherapy was grueling, but telling her parents and her children—she and her husband have two boys, 23-year-old Jared and 18-year-old Zachary—that she had cancer was one of the worst experiences in her life. Looking back, Michelle can’t imagine going through this journey without the incredible support from her family and friends. She encourages other women to remain positive, as she did during her cancer treatment. Michelle encourages other women to make sure they get their annual checkups and to not ignore the warning signs.